This is a cake I'd made a couple of years ago. I know it'll bring some cheer to those of you longing for warmer weathers. I for one, can't wait for summer to end. I think I've had my share of the heat. This cake is really simple to put together. This cake is covered with marzipan and fondant and decorated with royal icing and gumpaste flowers. Everything is made from scratch. I will try and put up a step by step post when I make this again. It will also dress up an Easter table well. I think it makes a lovely gift for Mother's Day too. 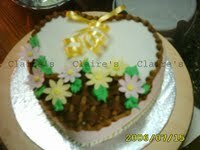 It is a heart shaped cake with a basket weave pipping to resemble the basket, dotted with gumpaste daisies and royal icing pipped leaves, finished off with a bow made out of curling ribbon. Gorgeous cake- awesome job on the frosting! Thanks for visiting my blog and for ur sweet comments !! u have wonderful blog !! happy to follow u !! Cake looks so nice and excellent frosting !! That is a lovely cake, Trisha :))two thumb up dear!